“Mchare” is an important cooking banana in Tanzania and parts of Eastern Africa. Its production, and hence the food and income of millions of smallholder farmers, are currently threatened by several pests and diseases attacking the crop including black sigatoka, fusarium wilt, weevils, and nematodes. 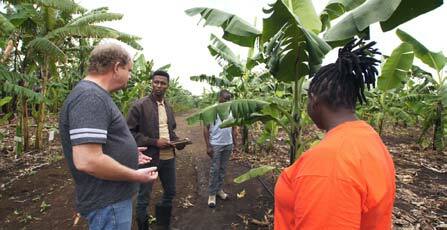 Banana Breeder Allan Brown in a discussion with members of the research team. IITA has established the first ever breeding program for the crop in Arusha, Tanzania, and together with national and international partners, IITA researchers are working diligently to develop high-yielding disease resistant hybrid “Mchare”. This is an arduous task due to the sterile and sexless nature of banana. According to IITA Banana Breeder Allan Brown, “There really is no other breeding program in the world that is focusing on these “Mchare” bananas so if we are not doing this, it’s not going to get done.” This work is part of the Breeding Better Banana project which seeks to develop and deliver improved hybrid banana in Tanzania and Uganda. In addition to this program, the IITA banana breeding team and its partners in Uganda and Nigeria are breeding “Matooke” and plantain, respectively. These are the most important cooking banana and plantain for food security in Africa.